Printed catalogues and directories have a long shelf life so they remain popular for companies who sell a large range of products. Consumer catalogues are still widely used for fashion, homeware, consumer electronics and gardens, while business-to-business catalogues are often used for components, machines, tools and other industrial products. When designing a catalogue it is important to consider the costs of production, printing and postage, for example the weight of paper you choose could have a big impact on your postage costs. Let’s take a look at some of the catalogue designing and printing best practices. Most catalogues are printed in 4 colours, although sometimes a fifth colour, typically a pantone (PMS), might be used to enhance a specific element such as the company logo. A good design and layout comes from an understanding of usability, organisation and aesthetics. The cover and contents page should work together to deliver an anticipation of what is in the catalogue. The best catalogues are highly visual and images should be at the heart of any catalogue. It is good practice to set the scene with mood images with interplay between people, products and environments. It is good practice for catalogue copy to follow a house style, this ensures consistency throughout. Defining the house style will often be one of the first tasks in the overall design process. It is important that the catalogue copy is concise and informative, its role is to provide the reader with the information required to make a purchase. Make it easy for consumer to interact with your catalogue. Refer to online promotions to drive traffic to your site. Clearly communicate when there are multiple options for ordering. 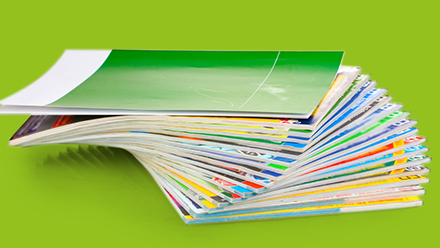 Typical catalogues utilise a 300/350gsm gloss, silk, matt or uncoated paper for the covers. Inside, the pages are typically printed on 100/130/150gsm silk, matt or uncoated papers. Matt or gloss laminated are popular choices. Textures and glosses can be used to highlight specific features. Common finishes include spot u/v, u/v varnished and foil blocking. These add a luxury feel that will definitely make a good impression on your customers. Catalogue and directory binding options depend largely on the number of pages and the weight. A perfect bound catalogue, for instance, provides a flat spine for printing a logo and title.